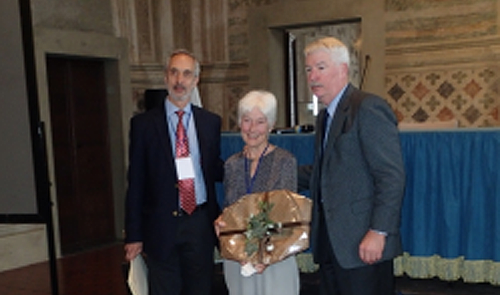 Kathleen Ruff, Rideau Institute Board Member and long-time human rights activist, was awarded the inaugural “activist” award by the Collegium Ramazzini and the Town of Carpi, Italy. The special award was given at the annual meeting on October 25 in Italy to honour “her steadfast and effective advocacy in the international effort to ban the ongoing use of asbestos and for promoting better occupational and environmental health protections throughout the world.” Kathleen Ruff’s public work on asbestos began in 2007, when she organized a social movement to close the asbestos mines in Canada. 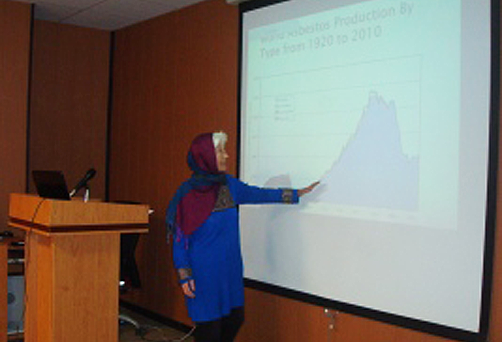 Her report, Exporting Harm: How Canada markets asbestos to the developing world, focused on the damage done by Canada’s export of asbestos, mostly to developing countries. Kathleen Ruff’s hard work, in conjunction with activists in Canada, led the government to eventually change the asbestos policy. Kathleen led the fight against the attempt to reopen the Quebec asbestos mines in 2012. Kathleen Ruff’s efforts on asbestos have been recognized by the Canadian Public Health Association in presenting her with their National Public Health Hero Award in 2011. The Collegium Ramazzini is proud to present this special award to someone who has partnered with us and has done so much to ban the further use of this deadly material. In bringing the perspective of human rights to the global asbestos struggle, her advocacy efforts have already helped to save countless lives and exemplify the mission of the Collegium to be a bridge between scientific work and the social and political efforts to protect public health. The Collegium Ramazzini is an independent, international acadamy working towards solutions of occupational and environmental health problems.